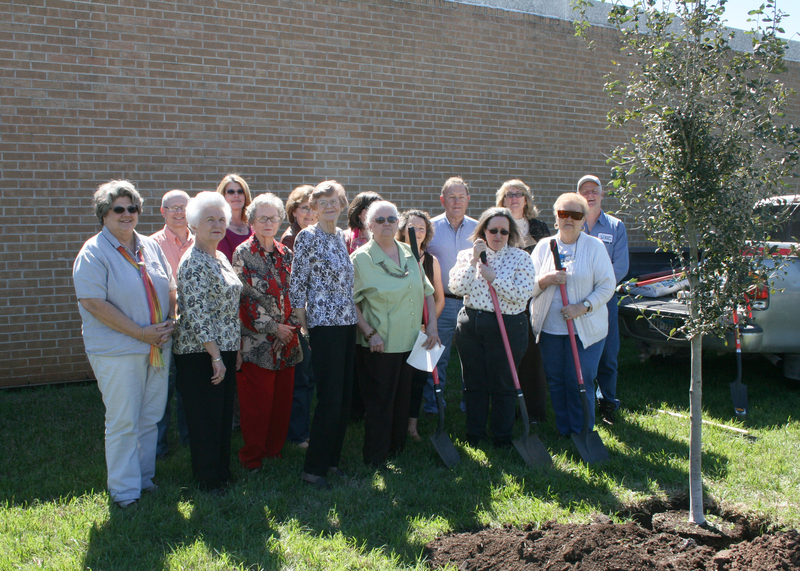 A tree was planted on the grounds of Coastal Bend College’s Peter S. Marecek Physical Fitness Center in honor of the late Ida Clarice Matheson McGuffin, a longtime garden club member and college supporter. Celebrating McGuffin’s life are, from left, Glynis Holm Strause, Coastal Bend College; Cris Wagner, CBC; Linda McKay, Beeville Garden Club; Connie Barnes-Rose, CBC; Sally Amthor, Beeville Garden Club; Gwen DeWitt, Beeville Garden Club; Jane Cecil, Beeville Garden Club Chaplain; Susan Smedley, CBC; Nyla Irwin, Beeville Garden Club Arbor Day Chairperson; Becky Camphill, Beeville Garden Club; Bob Wingenter, Beeville Garden Club; McGuffin’s daughter, Jan McGuffin; Sarah Milnarich, CBC; Teresa Holland, Beeville Garden Club President; and Mike Slaughter, CBC. Another tree will be planted at the college on April 18 in memory of Celia Reyes, a longtime member of the garden club, who also died in 2010.